Let me say, this salsa recipe has proven to go above and beyond my expectations. Every time I serve this salsa to guest, or give some to friends they compliment the salsa almost to where I’m a little embarrassed. It is THAT GOOD people. This last Christmas I made it for our “neighbor gifts” and before we got home we had many texts of how delicious it was and how the bottle was already half depleted. So let mettle you how I came to make this recipe. First, I have a belief that every pregnant woman should get to eat what she wants. I mean, food is a crazy thing when your pregnant, right?? First,I have these maddening cravings. Then I can’t eat or smell ANY food for weeks without wanting to barf (in other words, we eat out where I want). THEN when I can eat, my stomach is being squished to the size of a pea, so I hardly get to eat at all. Which is so unsatisfying. Pregnancy is the only time I can eat, guilt free, but my body only allows me to down one taco before I’m so full it’s coming back up. sad. I have a belief that every pregnant woman should get to eat what she wants. I mean, food is a crazy thing when your pregnant, right?? First, I have these maddening cravings. Then I can’t eat or smell ANY food for weeks without wanting to barf (in other words, we eat out where I want). THEN when I can eat, my stomach is being squished to the size of a pea, so I hardly get to eat at all. Which is so unsatisfying. Pregnancy is the only time I can eat, guilt free, but my body only allows me to down one taco before I’m so full it’s coming back up. sad. When I was pregnant with Jack. Just graduated from college, my husband forced me to try this hole in the wall Mexican place. His buddies had recommended it- Pre-Yelp Days.This restaurant is where my obsession with tacos began. It is where I had my first street taco- ever.I wanted to die. Where had these been all my life? And their SALSA. not to spicy (for my pregnant heart burn raging stomach) everything was dirt cheap- as were we. So we went there often. It can safely be said I was more than addicted to Villa Villas tacos and salsa. Bless them. On our last taco run, Nate asked the ladies how they make their salsa. Its so easy, I couldn’t believe it. Really? that’s it! Whole canned tomatoes. *** Buy the best quality canned tomatoes. Since the salsa will be 90% of this ingredient make sure it’s top notch. Quite often I buy the organic canned, and I swear it DOES make a difference. *** OR even try Fire-roasted! SO- to start. In your little food processor or blender add add cilantro, 1/2 an onion, garlic, and jalapeño and can of whole tomatoes. At this point the salsa will taste a little like Tomatoes. Canned tomatoes. It needs to sit and marry. If you can, store in an air tight container for a few hours to overnight in the fridge. If you only have an hour before your guest arrive then leave the salsa at room temperature and stir it often. 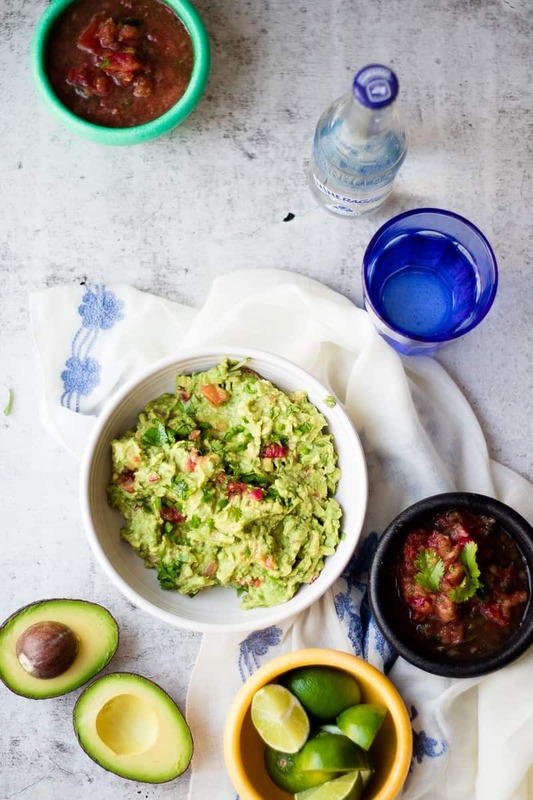 Serve with this Guacamole recipe or This smooth guacamole recipe and your party will be the BEST! Seriously- we all LOOOOVE this stuff. We use it in our omlets, my kids eat it for snacks at all times in the day. When there is fresh salsa in the fridge it is amazing what you find to eat with it. A fresh and zingy salsa made from scratch. Use this salsa as a dip with chips or on any Mexican dish! In a food processor or blender place onion, cilantro, garlic, and seeded jalapeño. Chop until very small but not mushed. Add can of tomatoes and quartered Roma tomatoes. Pulse until slightly chunky. Add salt, lime and pepper. Stir and taste test with salt. At this point the salsa will taste a little more like canned tomatoes than a salsa. The flavors need to sit and marry together. Allow salsa to sit, in fridge for a few hours, even over night in an air tight container. If you are serving salsa with in the hour, then leave the salsa at room temperature, stirring every 5-10 minutes until serving time. I love how easy this is, so yummy!